This blog started with the making of Goddess dolls but has moved onto more of the beading items that I have always wanted to make. 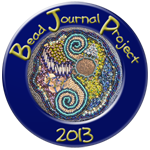 This is the beginning of my journey to doing more beading and designing. First day of the two day class and most exciting. A comprehensive selection of grey and white beads with mostly bugle but some delicas and #15 seed beads. 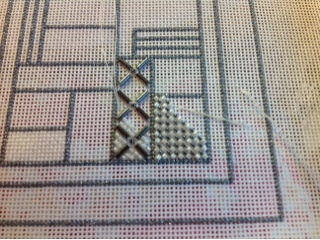 Here is a picture of the first two squares and in the morning I will post a picture of my days stitching. Have met a nice group of ladies and have been having lunch and dinner with them some nights. tonight I went off with Anne, Jessica and Chris to downtown Disney for dinner and fireworks. Really amazing show and went on for 15 minutes. Mum and dad had dinner in the hotel. Last night we went with Ewan to the outback restaurant across the road for dinner. Not in the top 10??? Contemporary Quilt and Fiber Artist.